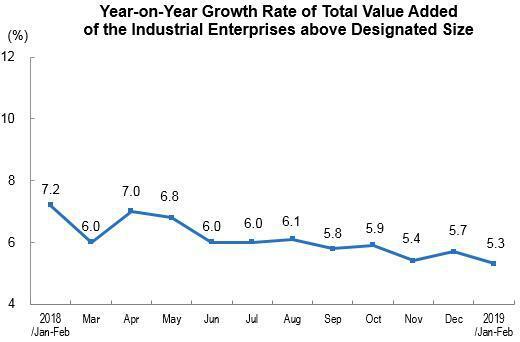 In the first two months in 2019, the total value added of the industrial enterprises above designated size was up by 5.3 percent year-on-year in real terms (the following growth rates of value added are real growth rates, after deducting price factors), 0.4 percentage point slower than last December. After adjusting the influences of 6.1 percent increase from the Spring Festival. 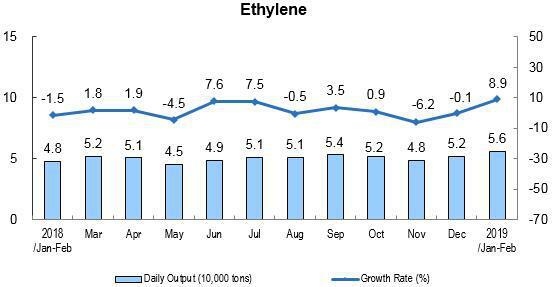 In February, the total value added of the industrial enterprises above designated size increased 0.43 percent month on month. 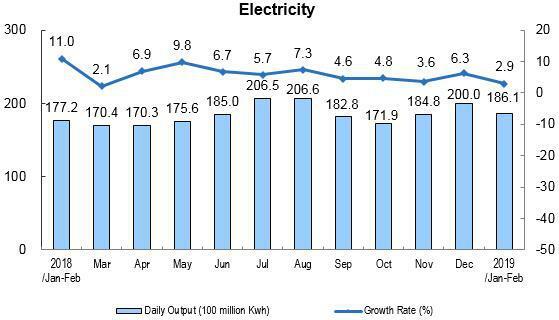 In view of three sectors, in the first two month, the value added of mining and quarrying increased 0.3 percent year-on-year, while the growth rate decreased 3.3 percentage points than last December; that of manufacturing increased 5.6 percent, an increase of 0.1 percentage point; that of production and distribution of electricity, heating power, gas and water was up by 6.8 percent, a decrease of 2.8 percentage points. Analysis on different types of enterprises showed that, in the first two months, the value added of the state holding enterprises increased 4.4 percent year-on-year; that of share-holding enterprises increased 6.4 percent; that of enterprises funded by foreign investors or investors from Hong Kong, Macao and Taiwan province decreased 0.3 percent; that of private enterprise increased 8.3 percent. Grouped by different sectors, in the first two months, 38 industries within 41 industrial divisions kept year-on-year growth. 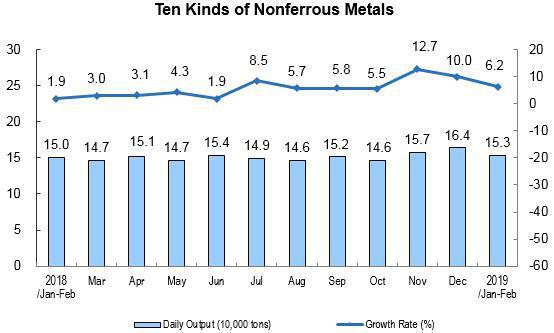 Of this total, the growth of processing of food from agricultural products up by 6.3 percent; the textile industry up by 0.2 percent; the manufacture of raw chemical materials and chemical products, up by 4.3 percent; the manufacture of non-metallic mineral products, up by 8.8 percent; the manufacture and processing of ferrous metals, up by 7.5 percent; the manufacture and processing of non-ferrous metals, up by 9.3 percent; the manufacture of general-purpose machinery, up by 4.4 percent; the manufacture of special-purpose machinery, up by 10.0 percent; the manufacture of automobile industry, down by 5.3 percent; the manufacture of railway locomotives, building of ships and boats, manufacture of air and spacecraft and other transportation equipment, up by 7.9 percent; the manufacture of electric machinery and equipment, up by 8.0 percent; the manufacture of computer, communication equipment and other electronic equipment, up by 6.0 percent; the production and supply of electric power and heat power, up by 6.1 percent. 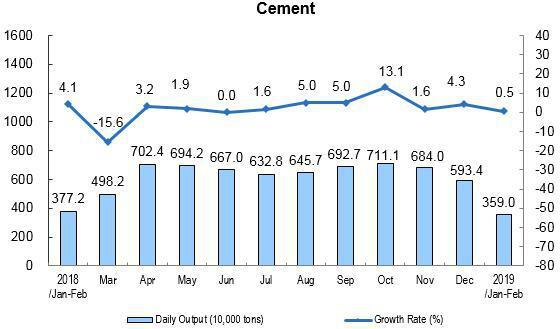 In terms of different regions, in the first two months, the value-added of eastern region increased 3.1 percent year-on-year; central region went up by 8.7 percent; western region went up by 5.8 percent; northeastern region went up by 5.3 percent. In terms of different products, 351 products within 605 products kept year-on-year growth. 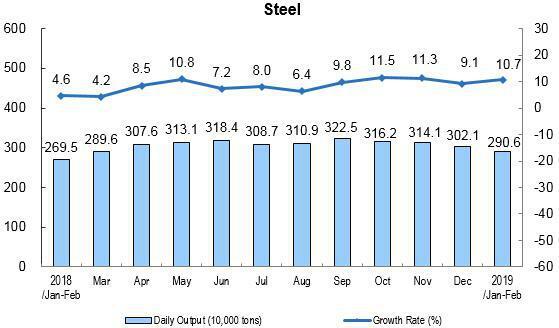 Of this total, the output of pig iron was 171.46 million tons, went up by 10.7 percent year-on-year; that of cement was 211.81 million tons, went up by 0.5 percent; that of 10 kinds of nonferrous metals was 9.03 million tons, up by 6.2 percent; that of ethylene was 3,310 thousand tons, up by 8.9 percent; that of automobiles was 3,720 thousand sets, down by 15.1 percent, Of which, that of cars was 1,458 thousand sets, down by 17.8 percent; that of new energy cars was 1,380 thousand sets, up by 53.3 percent; that of electricity was 1,098.2 billion kilowatt-hours, up by 2.9 percent; that of crude oil was 102.49 million tons, up by 6.1 percent. 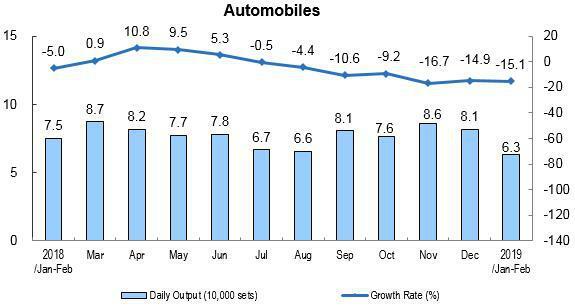 The sales ratio of industrial products in the first two months was 97.9 percent, a decrease of 0.3 percentage point from that in the same period of last year. The total export delivery value of industrial enterprises was 1,725.5 billion yuan, an nominal increase of 4.2 percent year-on-year. Export delivery value: refers to the foreign trade department of industrial enterprises or self-run (commission) exports (including sold in Hong Kong, Macao and Taiwan), with the price of foreign exchange settlement of product value, and foreign samples, materials processing, component assembly and compensation trade product value. The standard starting point of industrial enterprises above designated size was 20 million yuan of annual revenue from primary business. 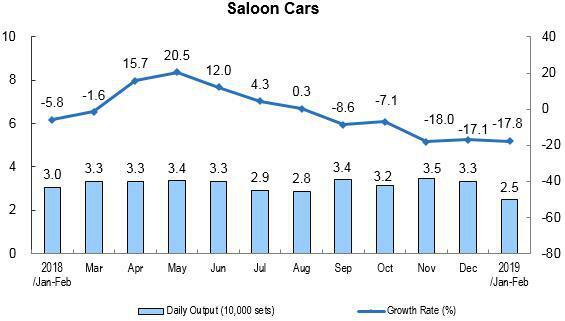 Due to the annual changes of the coverage of industrial enterprises above designated size, and in order to ensure that the data for this year is comparable with that of the previous year, the data of the corresponding period used for calculating the year-on-year growth rates of various indicators such as product output is as consistent with the enterprise statistical coverage of the current period as possible, and there is a difference in caliber from the data published last year. The main reasons are: (1) Coverage changes of statistical units. Each year, some companies will be included in the survey after having reached requisite size, and some will exit the survey due to their smaller size, and there are also influence of new built and starting enterprises, bankruptcies, and companies that have been suspended or sold. (2) There is cross-regional repeated calculation in the output data of some enterprise group (company) products, which has been eliminated according to specific surveys. Eastern region includes Beijing, Tianjin, Hebei, Liaoning, Shanghai, Jiangsu, Zhejiang, Fujian, Shandong, Guangdong, and Hainan. Central region includes Shanxi, Jilin, Heilongjiang, Anhui, Jiangxi, Henan, Hubei, and Hunan. Western region includes Inner Mongolia, Guangxi, Chongqing, Sichuan, Guizhou, Yunnan, Tibet, Shaanxi, Gansu, Qinghai, Ningxia, and Xinjiang. Northeastern region includes Liaoning, Jilin and Heilongjiang. NBS enforces New Standard on Industrial Classification for National Economic Activities" (GB/T 4754-2017). 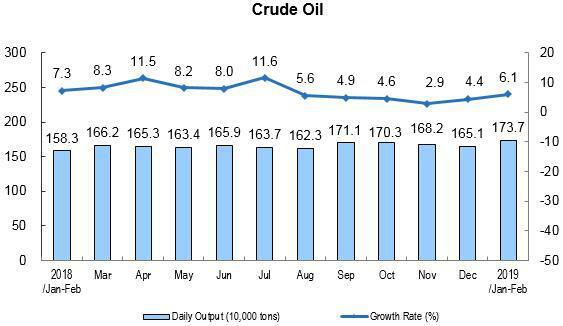 For details, please refer the following link: http://www.stats.gov.cn/tjsj/tjbz/hyflbz. The share-holding enterprise data released in the past refers to the enterprise whose registration type is “collective”. With the establishment of the modern enterprise system, the proportion of enterprises registered as “collective” is declining (, the operating income of share-holding enterprises accounts for all industries above designated size over the proportion of enterprises is only 0.18% in 2018), so from 2019, the release of share-holding enterprise data will be cancelled. 8. In order to eliminate the impact resulting from the Chinese New Year’s unfixed dates, and enhance the comparability of the data, according to national statistical system, the data of January and February over the years has been surveyed and released together.